The Philippines-Japan market is poised to see a huge influx of capacity, driven primarily by expansion from Philippine low-cost carriers. The expansion is made possible by a new air services agreement between the two countries and the lifting of restrictions by Japanese authorities on Philippine carriers. Cebu Pacific Air, which currently only serves one destination in Japan with three weekly flights, is seeking the biggest expansion with at least 80 additional weekly flights and eight new destinations. AirAsia is planning to enter the Philippines-Japan market with 32 weekly flights while Tigerair is looking to enter with 56 weekly flights. Philippine Airlines (PAL) and its regional subsidiary PAL Express are seeking to add 63 weekly flights. PAL is currently the market leader with 31 weekly flights to Japan. In the total there are currently only 76 weekly flights between the two countries, a figure which should quickly double and possibly triple depending on how many of the proposed new flights are implemented. 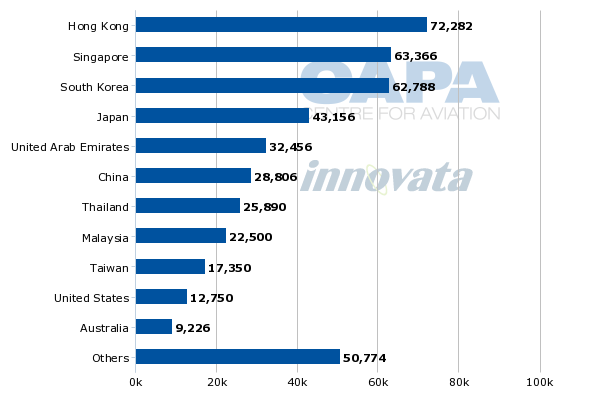 Philippines-Japan has been an under-served market over the last five years due to Japanese Civil Aviation Bureau (JCAB) restrictions preventing Philippine carriers from increasing capacity because Philippine authorities were not in compliance with ICAO safety standards. Japanese authorities recently agreed to lift the restrictions, meeting a request from Philippine authorities who had been lobbying JCAB since passing an ICAO audit in early 2013. The Philippines and Japan also agreed in mid-Sep-2013 to a new air services agreement which increases the number of weekly flights allowed between Manila and Tokyo Narita for each side from 119 to 400. New traffic rights to Tokyo Haneda have also been made available, with an initial allotment of 14 weekly flights for each side. Philippine authorities will need to distribute the Haneda rights between PAL, PAL Express and Cebu Pacific as all three carriers have applied. Unlimited rights were granted for routes connecting any Philippine airports except Manila and any Japanese airports except Haneda. This will allow an unlimited number of flights from Japan to Philippine holiday destinations such as Cebu and Kalibo - markets where there is significant LCC potential. Under the previous air services agreement there were still available traffic rights but they have been meaningless since 2008 due to the JCAB restrictions. The restrictions were particularly harmful to the Philippines vibrant LCC sector. Over the last five years Philippine LCCs have expanded significantly in the domestic market and to other regional international destinations such as Singapore. But Japan has been off limits despite being within narrowbody range of the Philippines. The Philippines-Japan is also a natural LCC market because Japan is one of the largest source markets for the Philippine tourism industry and has a large overseas Filipino population. With Philippine LCCs now able to pursue expansion in Japan, the market can be stimulated with low fares and new routes. 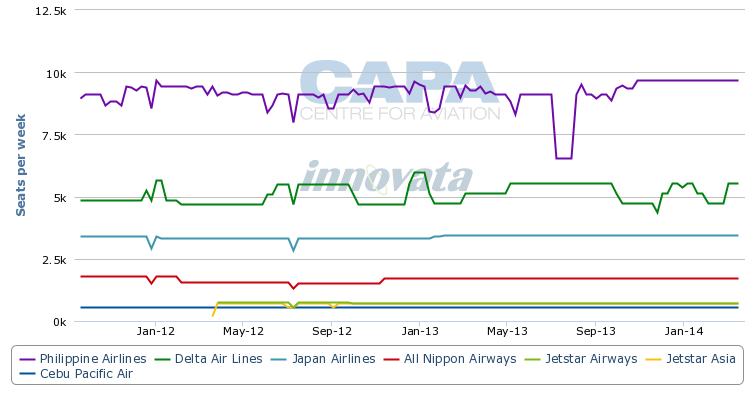 Philippine-Japan fares have traditionally been high, making it a profitable market for PAL and other legacy incumbents. The lack of expansion in the market had benefitted PAL as before the restrictions were put in place PAL already had the largest operation between the two countries. The restrictions also have benefitted Japanese carriers and fifth-freedom carriers. Jetstar and Delta both serve the Philippines-Japan market, taking advantage of pick-up rights while Philippine carriers have been unable to expand. Delta currently operates 13 weekly flights to the Philippines including seven from Manila to Tokyo Narita and six from Manila to Nagoya. These flights continue onto to the US but Delta is able carry a large volume of local passengers as it uses 747-400s rather than Japan-based narrowbody aircraft for both services. Jetstar offers eight weekly A320 flights from Manila to Osaka, according to Innovata data. Four of these flights originate in Singapore and are operated by Jetstar Asia and four originate in Darwin and are operated by Australia-based Jetstar Airways. Japanese carriers currently only operate 21 weekly flights to the Philippines. It is somewhat surprising they have not responded to the opportunities created by the inability of Philippine carriers to expand. Japan Airlines (JAL) currently operates two daily flights between Manila and Tokyo Narita while All Nippon Airways serves the route with one daily flight. Both carriers use 767s on the route. PAL’s market leading 31 weekly flights to Japan include one daily flight from Manila to Tokyo Narita using 777-300ERs, one daily flight from Manila to Nagoya using A330s, six weekly flights from Manila to Osaka Kansai using A330s, five weekly flights from Manila to Fukuoka using A320s and five weekly flights from Cebu to Tokyo Narita using A330s. Cebu Pacific’s only route to Japan, which it launched in 2008, connects Manila with Osaka using A320s. PAL currently has a 43% share of seat capacity between Japan and the Philippines. Delta has a 24% share followed by JAL with 16% and ANA with 8%. Jetstar has about 6.5% and Cebu Pacific about 2.5%, giving LCCs only a 9% share of total capacity. Jetstar, which began serving the Manila-Osaka route in 2012, has accounted for nearly all the limited growth the Philippines-Japan market has seen over the last two years. 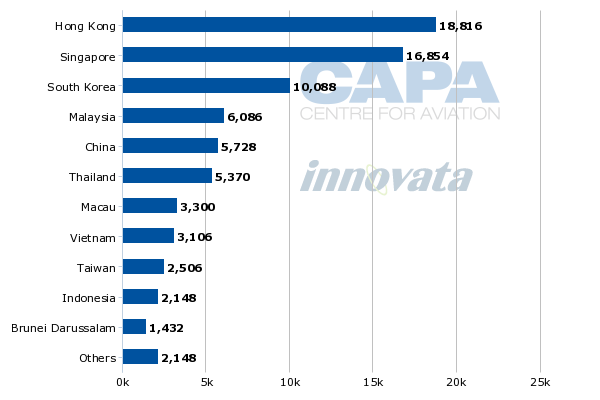 In comparison, LCCs currently account for 38% of seat total capacity between the Philippines and South Korea, 50% of seats between the Philippines and Singapore and 50% between the Philippines and Malaysia. All these markets along with Philippines-Japan consist of flights in the three to four and a half hour range, making them ideal for LCCs. Japan is currently the Philippines’ fourth largest international market after Hong Kong, Singapore and South Korea. With more LCC penetration, the market could easily overtake South Korea and Singapore. There are currently about 43,000 weekly return seats between the Philippines and Japan compared to about 63,000 seats for Philippines-South Korea and Philippines-Singapore. The Philippines-China market also has huge potential but growth over the last 18 months has been set back by a rocky political relationship between the two countries. With China growth unlikely for the short-term and most other short-haul international markets already penetrated, Philippine LCCs are relying heavily on the Japanese market to support their growth ambitions. Philippine LCCs need to expand internationally as the domestic market has become extremely competitive with over-capacity on some routes and at times irrational pricing. Cebu Pacific stated in early 2013 that it could allocate the equivalent of two A320s to new Japanese routes once the Philippines-Japan market opens up. Cebu Pacific has the advantage over other Philippine LCCs in that it is already in the Japanese market and has the largest portfolio of slots at Manila Ninoy Aquino International Airport. This gives the carrier an opportunity to launch flights from Manila to Japan by juggling its slots. Cebu Pacific recently applied to the Philippines Civil Aeronautics Board to serve eight new destinations in Japan from Manila: Fukuoka, Hiroshima, Ibaraki, Nagoya, Okinawa, Sapporo, Tokyo Haneda and Tokyo Narita. Cebu Pacific would be the first carrier to link Hiroshima, Ibaraki, Okinawa and Sapporo with the Philippines while it would provide new LCC competition to the bigger markets of Fukuoka, Nagoya and Tokyo. The carrier is also expected to expand on the Manila-Osaka route, which it currently only serves with three weekly flights. Cebu Pacific did not apply for additional Manila-Osaka entitlements as it already holds additional rights for Osaka that were previously allocated but it was unable to use due to the JCAB restrictions. Daily services from Manila to Hiroshima and Sapporo would be added in Oct-2014. A launch date for Ibaraki has not yet been provided. Cebu Pacific is also seeking to launch daily services from its second largest hub Cebu hub to Tokyo Narita, Osaka Kansai and Nagoya. These routes would all begin in 4Q2014. Cebu Pacific could potentially serve the Japan market by the end of 2014 with as many as 14 daily flights. This assumes daily services on 12 routes and double daily on Manila-Tokyo Narita. This would give Cebu Pacific about 35,000 weekly seats in the Philippines-Japan market. It seems doubtful Cebu Pacific would launch so many routes in just one year. Eight new international destinations would be unprecedented for the carrier, which will also be busy in 2014 adding new medium/long-haul destinations as it grows its new A330 fleet. Cebu Pacific’s current international network consists of 21 international destinations. Cebu Pacific is also only planning to grow its A320 family fleet by one aircraft in 2014, from 38 to 39. But the carrier does have flexibility to accelerate narrowbody expansion by extending aircraft leases. Currently its 2014 fleet plan includes five new A320 deliveries and four lease returns. Some of these leases could be extended to support the expansion in the Japanese market. Cebu Pacific could also use some of its A330 fleet, which will grow from two to four aircraft in 2014, to serve some of the new Japanese routes, particularly Haneda and or Narita. If Cebu Pacific follows through on the proposed new routes, Japan would easily become its largest international market – roughly double the size of its operations to Hong Kong and Singapore. This sounds difficult to believe, but Japan does have the potential to develop into this kind of market for Cebu Pacific. 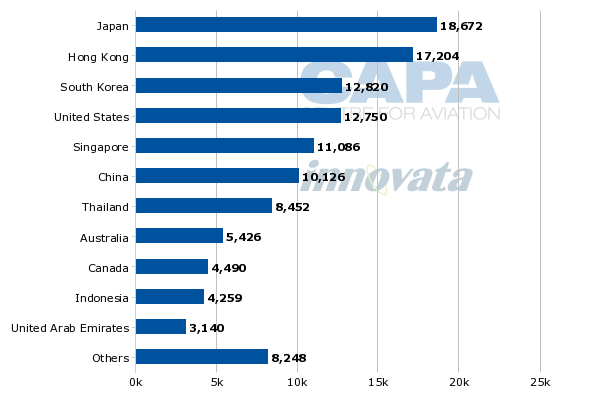 Japan is already PAL’s largest single market based on seat capacity. Cebu Pacific has more capacity than PAL in other short-haul international markets, including Hong Kong and Singapore. This further illustrates the huge potential Japan has for Cebu Pacific. PAL currently has about 18,700 seats in the Japanese market and could add as many as 17,000 weekly seats if it uses widebodies for the proposed four additional flights from Manila to Tokyo. PAL said in its recent application that it would add two daily Narita flights from 27-Oct-2013 and launch two daily flights to Haneda on 30-Mar-2014. PAL Express could also add about 12,000 weekly seats to and from Japan if it launches the five daily flights it is seeking. This includes two daily flights each from Manila to Tokyo Haneda and Tokyo Narita and one daily frequency on the Cebu-Tokyo Narita route. PAL Express, formerly known as AirPhil Express, operated under the LCC model until early 2013. It now provides a full service but has kept elements of the low-cost model and is used by the PAL Group to compete against LCCs. PAL Express could emerge as the main PAL Group competitor in the Manila-Tokyo market for Cebu Pacific as well AirAsia and Tigerair. AirAsia and Tigerair have applied for seven weekly and 14 weekly Manila-Tokyo Narita entitlements, respectively. The prospect of eight carriers competing between Manila and Tokyo Narita, double the current four (ANA, JAL, PAL and Delta), could quickly lead to over-capacity. There is demand to support more capacity in the market but not necessarily so many players. The opening up of the Manila-Haneda market could exacerbate the situation as some of the demand in the Manila-Narita market migrates to more convenient Haneda. While the Japanese carriers are unlikely to respond to most of the new flights by the Philippine carriers, ANA and JAL will almost certainly look to use the 14 weekly entitlements that will be made available to Japanese carriers in the Manila-Haneda market. Some of Japan’s new group of LCCs could also eventually compete in the Manila-Narita market, particularly Jetstar Japan as the Jetstar Group is already competing in the Manila-Osaka market. But this is not likely in the short to medium term as Narita-based Jetstar Japan is focused on building up its domestic operations with international flights not to launch before 2H2014. Peach has moved aggressively in international markets, albeit from its Osaka Kansai base, but its furthest southern route is Hong Kong, about its self-imposed duration limit. Southeast Asian points could be served from a potential Okinawa hub. Vanilla Air, to be re-born out of AirAsia Japan, is re-building its network but with an eye to open new beach leisure markets. The Philippines could fall under this objective. With so much capacity being poured into Manila-Tokyo, the opportunities to launch services in markets other than Manila may become more appealing to LCCs. On the Japanese side, ANA and JAL will be challenged by their exceptionally high cost base to serve a very price sensitive market. Cebu, which is a bigger tourist destination than Manila, could particularly support a lot more capacity. In addition to Cebu Pacific seeking to launch daily flights from Cebu to Tokyo Narita, Osaka Kansai and Nagoya, AirAsia and Tigerair have applied to link Cebu with Japan. AirAsia aims to serve the Cebu-Osaka market with four weekly flights while Tigerair has applied to serve Cebu-Tokyo Narita with an aggressive double daily service. AirAsia and Tigerair are also both seeking to launch services to Japan from Kalibo, which is a gateway to the popular resort island of Boracay. Tigerair is proposing daily services from Kalibo to Tokyo Narita and AirAsia is proposing three weekly flights to Nagoya and four weekly flights to Osaka. All the proposed AirAsia-branded flights would be operated by Zest Airways, which is in the process of being re-branded as AirAsia Zest. All the Tigerair-branded flights would be operated by Tigerair Philippines, previously known as SEAir. Zest is very eager to launch Japan services within the next couple of months as AirAsia expands its Philippines-based fleet of A320s in 4Q2013 from 13 to 16 A320s. In addition to the Kalibo and Cebu flights, Zest is seeking to launch daily services from Manila to Tokyo Narita, Osaka and Nagoya. Zest has stated it plans to launch all six of its planned Japan routes by the end of 2013. The 32 weekly flights to Japan are an important part of an attempt by the AirAsia Group to turn around its unprofitable Philippine operation. Currently AirAsia mainly operates domestic services within the Philippines along with international flights to China, Malaysia and South Korea. Tigerair Philippines also has been struggling financially and could use new markets to diversify its current operation, which includes domestic services as well as international flights to China, Hong Kong, Singapore and Thailand. In addition to Cebu and Kalibo to Tokyo Narita, Tigerair Philippines is seeking to serve Narita from Manila and Manila alternative airport Clark with two daily and one daily flight respectively. It is also seeking to launch daily services from both Manila and Clark to Osaka. But Tigerair Philippines did not propose a launch date in applying for entitlements for six routes to Japan. This is likely because the Tigerair group, unlike AirAsia, has not yet committed to expanding its Philippines-based fleet. Tigerair Philippines currently operates five A320s and has not been allocated any additional aircraft from the Tigerair order book for the fiscal year ending 31-Mar-2014. A decision on adding aircraft, or dropping some existing routes, could come after Tigerair Philippines secures the requested route authorities. All the requests from Zest and Tigerair Philippines should be approved as there is now space in the bilateral for significant expansion from Manila while the non-Manila flights, including Clark, are not subject to any cap. The only battle for rights will be for Haneda, which Zest and Tigerair Philippines are not seeking. But the carriers could re-consider some of the routes after securing the authority to operate, depending on market conditions and how quickly their competitors move. The Philippines-Japan market will not be able to support all 231 of the proposed additional flights from Philippine carriers, or 210 when factoring in that 21 of the 35 proposed Haneda flight will need to be rejected. There are huge opportunities in the Philippines-Japan market, particularly for LCCs. The opening of the market comes at a critical time as some of the country’s carriers have limited expansion opportunities. But there is a risk that the Philippines-Japan market could quickly swing from under-supplied to over-supplied, leading to the irrational competition that has at times plagued the Philippines domestic market.